Industrial - A bulb and capillary instrument capable of reading and/or controlling temperature utilizing a relay. Product numbers started with 135. No direct replacement but can be replaced by any number of electronic or mechanical options. Obsolete Product . . . Contact M&M for options. Industrial - Similar to the #11 regulator but smaller in stature and in some cases smaller sensing bulbs. Some options may be available but mostly replaced by the #11. 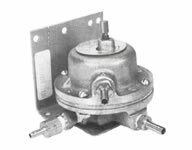 The Type 597 Regulator is a self-actuating control which controls fluid temperatures automatically by a vapor pressure thermal system activated by a volatile liquid. Commercial – Master mixing valve for high flows or multiple shower applications. No direct replacement, re-apply 430 series. Industrial - Circular chart recorders and controllers powered by wind-up or electrical motors. Many options for sensing elements which were filled capillary systems. No direct replacement but can be replaced by any number of electronic or mechanical options. Industrial – A pneumatic device utilizing differential pressure to send a control signal. No direct replacement but can be replaced by any number of electronic or mechanical options. M&M recently bought the remaining stock and the rights to manufacture the Series 200 temperature and pressure controller. We have pilot valves, thermal systems, complete units and a wide variety of parts available. Obsolete Product . . . Contact M&M for price and availability.